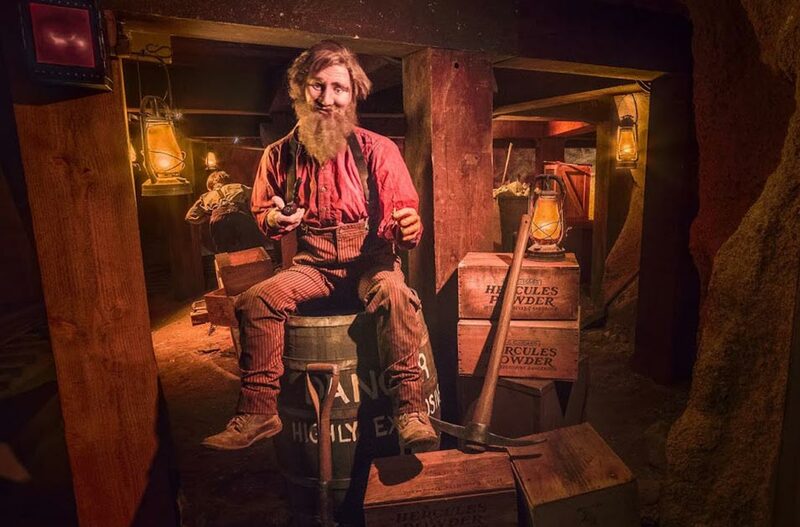 This beloved attraction carries riders aboard ore cars, on a realistic adventure through dimly lit tunnels of a working gold mine. The winding journey takes passengers to underground lakes, waterfalls, caverns filled with thousands of mysterious formations, chambers filled with steaming, bubbling pots and geysers. At several points in the trip, riders find themselves along the rim of a sixty five foot deep and ninety foot wide scene filled with dozens of animated miners trying to strike it rich. The Calico Mine Ride, Knott’s first major ride, opened in Ghost Town in November 1960 and was quickly recognized as one of the world’s most immersive “dark rides.” The beloved attraction, designed by industry pioneer Bud Hurlbut, carries riders aboard ore cars on a realistic adventure through dimly lit tunnels of a working gold mine. The winding journey takes passengers to underground lakes, waterfalls, caverns filled with thousands of mysterious formations, chambers filled with steaming, bubbling pots and geysers. At several points in the trip, riders find themselves along the rim of a sixty five foot deep and ninety foot wide scene filled with dozens of animated miners trying to strike it rich. The attraction’s rustic wooden loading platform has been refreshed and now includes a “peek-in” similar to those found throughout Ghost Town, offering guests windows into the rich mining history of the 1850s on their way toward boarding the mine train car. 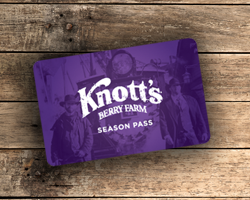 Knott’s Berry Farm’s Design Team, in partnership with Garner Holt Productions, Inc., has elevated Hurlbut’s 1960 design while preserving the original mining experience. 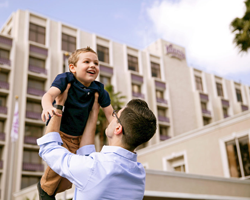 Nearly fifty animatronic humans and dozens more animals populate the updated adventure, with more than 120 characters spread through classic and re-imagined scenes. New denizens of the mountain include an old miner just inside the first tunnel who will welcome guests into the Calico Mine and warn them of dangers that lie along the rails ahead. 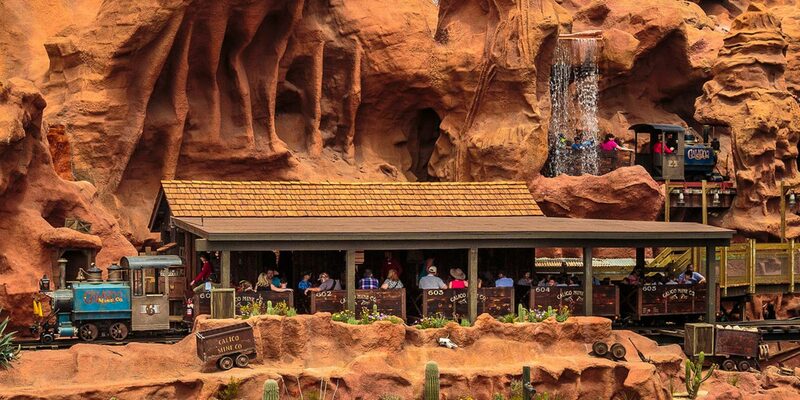 Despite the massive mining operation depicted inside the Calico Mine, since the attraction first opened, no character has ever actually found gold in the mountain. As part of the renovation, one lucky miner will be seen striking it rich with gold in-hand! 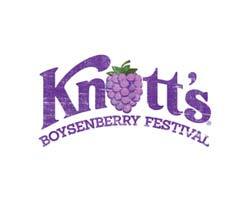 In January 2014 the attraction closed for a comprehensive five month restoration by Knott’s Berry Farm’s design and production team. 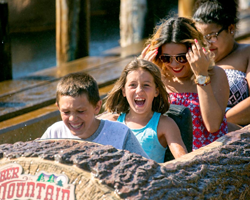 The project was another partnership with Garner Holt Productions, Inc., the team that brought award winning new enhancements to the Timber Mountain Log Ride in 2013 with lifelike animatronics and stunning show scenes. 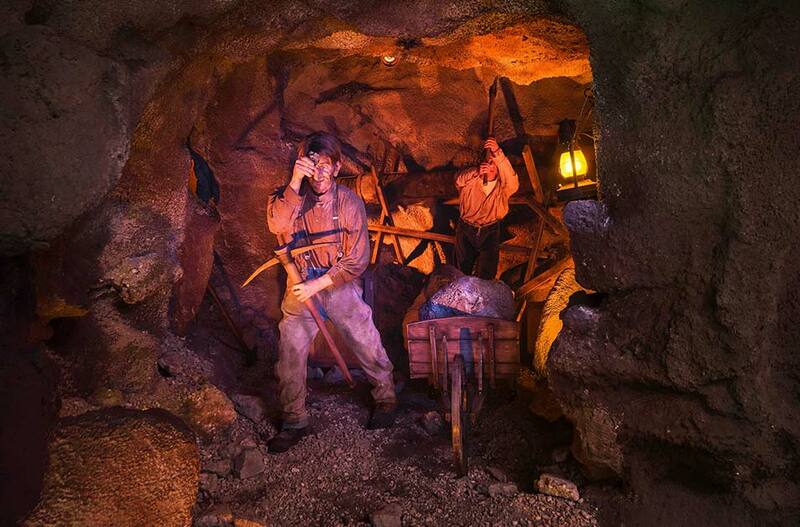 The renovation of the iconic attraction includes the addition of over 50 new state-of-the-art animatronic figures, all new audio and theme lighting system, and special effects that will capture the imagination of would-be miners as they journey deep into the winding caverns of the attraction.